A switch to district-only voting would be a win for coal in Whatcom County. Coal companies want to build the biggest coal export terminal in North America just north of Bellingham, Washington. The Gateway Pacific Terminal at Cherry Point would send more than 48 million tons of coal a year to Asia. Most Washington voters oppose exporting coal through the Evergreen state, so the moneyed interests that would profit from the coal terminal have enlisted conservative politicians in Whatcom County in a crusade to ensure that coal wins, whether voters like it or not. Here are coal interests’ strategies to circumvent voters in Whatcom County. In 2013, coal interests spent more than $170,000 through the SaveWhatcom PAC and Whatcom First PAC to try to elect candidates who would give coal the green light. (The Public Disclosure Commission fined the two pro-coal PACs $4,500 for illegally funneling money through the Republican Party and failing to report their contributions in a timely manner.) In addition to donating to the PAC, SSA Marine, a Seattle company that would build the coal terminal, is funding an ongoing campaign in support of the project. But clean energy proponents out-spent coal in this round: Washington Conservation Voters, bolstered by $275,000 from the NextGen Climate Action Super PAC, spent $330,000 on county campaigns. Anti-coal terminal candidates swept the election, winning all four of the Council races. Coal interests lost the battle, so they switched tactics. In November 2014, voters elected 15 Charter Review Commissioners to propose amendments to the County Charter for the November 2015 ballot. Coal interests funneled nearly $8,000 through the Whatcom First PAC and the Republican Party to ensure that Republican-leaning candidates won 9 out of 15 seats on the Commission—60 percent of the seats, even though the County consistently votes only about 40–45 percent Republican. Commissioner Chet Dow was originally listed as an officer of the coal-funded SAVE Whatcom PAC when it registered in 2013 (his name was removed in February 2015, one day after Dow voted to approve the amendment described below), and he appeared as a representative of the PAC at a Public Disclosure Commission hearing in 2013. Coal-funded PAC spent tens of thousands of dollars supporting Commissioner Ben Elenbaas’s unsuccessful bid for a seat on the County Council in 2013. Commissioner Eileen Sobjack was a donor to the coal-backed Whatcom First PAC and is an officer of the Republican Party that funneled money from coal interests to pro-coal candidates in 2013. With a solid (if unrepresentative) majority on the Commission, pro-coal commissioners rolled up their sleeves to lock in their advantage. The Republican Charter Review Commissioners entered the Commission with a clear mission: change the Whatcom County voting system so that a minority of voters could consistently secure a majority of seats on the County Council, enabling the new coal terminal to get its permits even if a majority of voters objected. Commissioner Chet Dow even said so in print. 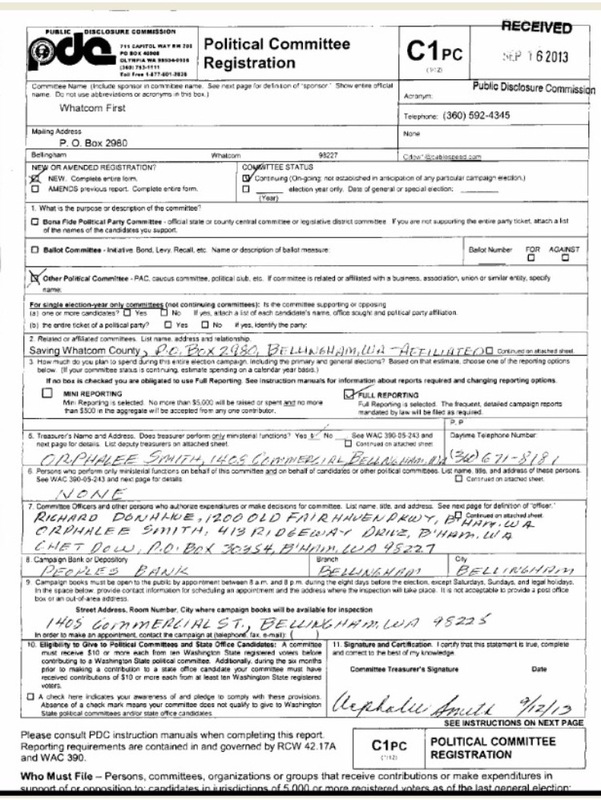 He wrote that it was critical to change the voting system (“Amendment 1” in the linked document) in order to get the County Council to “issue the needed permits” for the coal terminal. The amendment would switch the county from county-wide voting for all seven seats to district-only voting for six seats. Although county voters favor Democrats, district boundaries are gerrymandered so that most liberal voters are crowded into District 1—which votes about 70 percent Democratic—leaving conservative voters with a slight majority in Districts 2 and 3. Up to now, the district boundaries haven’t been so important because all county voters get to vote for all seven council seats in the general election. Switching to district-only voting for six seats would mean voters would only be allowed to vote for three council seats—two candidates in their own districts, plus the one county-wide candidate. This would give Republican voters in Districts 2 and 3 the chance to choose four of the seven council members. Approximately 33 percent of the voters would control 57 percent of the council. Keeping the gerrymandered districts and changing the voting system would make it possible for Republicans to consistently win 57 percent of the seats in a county that consistently votes only 40–45 percent Republican. Pro-coal interests could lock in an undemocratic advantage created by gerrymandered districts and winner-take-all voting. Just one month into the Charter Review Commission’s six-month process, with almost no public comment about the district-only voting scheme, the conservative faction rammed through a proposed amendment that would switch voting for Whatcom County Councilors to district-only voting for six out of seven seats. Four months later, at a June 8, 2015 meeting, the Commission met in a more rural part of the county and heard hours of public testimony opposing district-only voting. Rebecca Boonstra of Kendall testified: “I want all county council members to have to think about all of us, and I want all of us to have to think about them.” Gail Weiss said her community is “part of Whatcom County as a whole. I’m against trying to divide us further.” And Michael Rollby warned the commission that if you limit voters’ right to vote for all councilors, you “limit the people’s ability to speak their mind” through their votes. In light of the voluminous public comment, progressive commissioners moved to reconsider the district-only amendment, but were stymied by the coal-backed majority. All six progressive-leaning members of the Commission and conservative Ken Bell voted to give voters the option on the November ballot to choose proportional representation. (Bell “was a Republican for years” but is now disenchanted with both parties, figuring ideas should matter more than political party.) Six Republican-leaning commissioners voted against, leaving the proposal one vote shy of going to the voters. The previous Charter Review Commission, in 2005, also narrowly approved an amendment to switch to district-only voting, and voters approved the change by 67.28 percent. The 2007 council election was district-only voting, and voters didn’t like it. In 2008 they voted to go back to county-wide voting. The Republicans learned their lesson: don’t give voters’ the option to go back to a fairer voting system. Conservative members of the Commission approved a proposed amendment that would prevent the County Council from letting voters vote on charter amendments if a previous amendment has already been approved by two-thirds of voters. In other words, if coal interests can secure a two-thirds vote for district-only voting and majority approval for the limiting amendment, voters will be stuck with district-only voting whether they like it or not. In November, voters will have the chance to reject the coal-sponsored 3-district voting amendment to the Whatcom County charter. Then, Whatcom could work on instead moving to proportional representation to empower every voter to elect a diverse and representative council. It’s kind of like how Bib Transit likes the oligarchy. Nothing short of ingenious — give a bunch of political appointees limitless regressive taxing authority and the power to set multi-billion dollar budgets, then watch the fat, fat contracts roll in. Democracy would DEFINITELY stop the gravy train, so making people utterly powerless to exert control over the board by any political means is the ultimate solution. Any lawyers read Sightline? Let’s discuss whether Sound Transit’s board structure satisfies that key limit on state’s powers set by the equal protection clause of the 14th Amendment: Americans’ right to vote for and against local legislators. The next to final sentence in Coal Strategy #1 says: “Anti-coal terminal candidates swept the election, winning all four of the empty Council seats. There were no open seats in 2013. All four incumbents ran for reelection. Two were defeated and two were reelected. Thanks – I have corrected this. Pro-coal interests could lock in an undemocratic advantage created by gerrymandered districts and winner-take-all voting. A previous Charter Review Commission narrowly approved an amendment to switch to district-only voting. Thanks to Thomas & Celine Gihring for supporting a sustainable Northwest.